Border check point at Kiossi is seen, June 5, 2018, after Cameroon and Equatorial Guinea reopened six months after it was sealed to stop the movement of armed groups that fought to overthrow President Teodoro Obiang Nguema. Cameroon and Equatorial Guinea have reopened their border six months after it was sealed to stop the movement of armed groups that fought to overthrow President Teodoro Obiang Nguema, who has led Equatorial Guinea since 1979. Strict controls remain on movement across the border. It is a busy Wednesday morning at the main bus station in Ebebiyin, a north eastern town in the part of Equatorial Guinea that is on the African mainland. Business persons from neighboring Cameroon and Gabon are transporting goods to and from the tiny central Africa state. Ephraim Mukwah, a 43-year old Cameroon-born truck driver, said they are happy Equatorial Guinea officials have finally authorized them to have access to Cameroon. He said people are very grateful and happy as the town's taxi business is picking up and buses and trucks can now freely circulate between Cameroonian border towns right to Bata, the economic capital city of Equatorial Guinea. 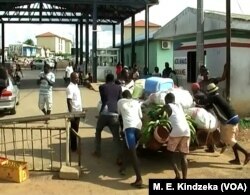 Youths push goods from Cameroon through the border to Equatorial Guinea, June 5, 2018. Cameroon supplies food items, building material and motor spare parts to Equatorial Guinea while Equatorial Guinea delivers beverages, and vegetable oil to Cameroon. Forty-year old Equatorial Guinean business woman Rosaline Avah said there has been a huge movement of goods and people to and from Ebebiyin within the past two weeks after Equatorial Guinea officials announced that the borders had been completely reopened. She said she is just returning from the first business trip to Cameroon in five months. She said they went to the Cameroonian border town of Kiossi with nine trucks of wine, whiskies and vegetable oil on Friday last week with the hope of returning after two days. Instead, she said, they spent three additional days waiting for farm produce they bought from Cameroon to supply to their clients in the Equatorial Guinea border town of Ebebiyin and the country's economic capital Bata. She said she is happy they are doing brisk business after a long period of no trading. Rosaline, however, complained that the military checked them seven times between Bata and Ebebiyin, with all passengers asked to get out of their vehicles and pass through security checks. She said some people who did not have all of their identification papers were arrested. Equatorial Guinea closed its border with Cameroon on December 24, following a failed coup attempt in the oil-rich Central African state. On December 29, Equatorial Guinea's leadership said its forces had arrested a number of people moving towards the Cameroon border in possession of rocket launchers, rifles and a stockpile of ammunition. Officials alleged the group had accumulated the weapons to destabilize the government of President Teodoro Obiang Nguema, who has ruled the Spanish-speaking country since 1979 and is the longest-serving leader in Africa. His critics have historically characterized his government as authoritarian and corrupt. Cameroon said it arrested 40 heavily armed men on its side of the border and had strengthened security along the 290-kilometer boundary. The security measure, traders said, crippled economic activities. Handerson Quetong Kongeh, the highest-ranking government official in Ntem valley Cameroon border administrative unit, said the decision to reopen the border was taken following a series of meetings in which both countries agreed the threat to Obiang Nguema's presidency had passed. "Progressively serenity, peace, order and discipline reigns along the borders. So the Guinean authorities have judged for themselves that it was necessary to relax the exchanges and we think that if it continues in this way, the barriers will be completely uplifted," said Kongeh. Two months ago, the border was opened only two days every week and movement was under strict control of the Equatorial Guinea military. But today, movement is allowed daily, with impromptu and spontaneous checks by the country's police force. Cameroon and Equatorial Guinea are members of the six-member Economic Community of Central African States, CEMAC. Obiang, who celebrated his 76th birthday on Tuesday, was elected to a fifth seven-year term in 2016 in polls the opposition said were rigged in his favor. Equatorial Guinea, a former colony of Spain, is a tiny oil rich state with 1.2 million people.